The water in the Atlantic and Pacific Oceans has an average salinity of about 35 to 36g/l but, in regions such as the Persian Gulf, the salinity reaches 42g/l, figures that are to be compared with the salinity of drinking water which is between 0.1 and 0.5 g/l. The desalination to be carried out is therefore more or less intense. This can be done with several techniques which make it possible to eliminate about 99% of the salinity of salt water. Important note : this data sheet is of a very technical nature which can make it more difficult to read or understand than the others. It is therefore recommended to browse through the main elements especially and to discover the main characteristics of them without getting bogged down in the details or in the diagrams, unless there is a particular interest. 2) Who created and developed this technique ? 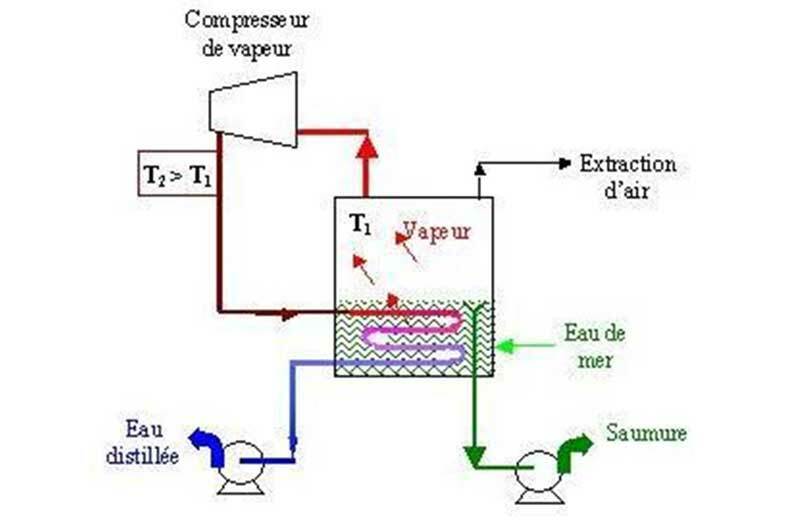 There are two main ways to desalinate seawater : the membrane treatment (reverse osmosis) and heat treatments (flash distillation, vapour compression). These processes have been developed on a large scale by major industrial companies, primarily French, Spanish, American, Japanese and Korean. But new techniques or new types of facilities of a pilot nature are starting to appear with small research companies or organisations especially for small fixed or mobile desalination units in remote sites. Currently, several million people live in regions that are suffering from serious water shortages. Desalination is a way to increase the supply of drinking water. Some experts are predicting that desalinated seawater will become a major source of water in the 21st century, considering that 42 cities with more than one million inhabitants are located on a coast and that a majority of the world’s population lives less than 50 km from the seacoast. 4) Who is concerned ? This method can be applied in regions that are close to the sea where resources in fresh water available for human consumption do not exist or are insufficient. The population must also have sufficient financial resources in order to cover the cost of it. Small units are used on many vessels and submarines, but also to supply hospitals and hotels on the coast. But new ones are now appearing for remote sites where brackish water must be treated. Major facilities are created in developed countries such as the Middle East, the United States, Spain and Australia because of the high cost of the infrastructures and of the cost in energy needed to run them. 5) What does this technique involve ? How is it used ? These are, and just about equally, reverse osmosis and the "heat" methods based on the distillation of seawater. This technique is often associated with an electrical power plant, with the exhaust vapours being used to supply the desalination units. Reverse osmosis is a system for purifying water via a pressurised flow through a semi-permeable membrane which has the property of retaining almost all of the dissolved salt. Starting with a quantity of seawater to be treated, about 40 à 45% of desalinated water is obtained through the membrane, while the other portion which contained seawater with a salt concentration must be discharged. These require energy in the form of heat. They run on the principle of evaporating seawater, with the condensing of the vapour then making it possible to recover water that is practically demineralised. There are several methods. 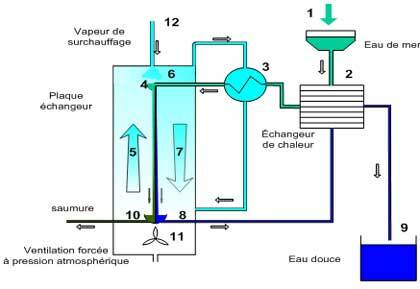 - Single effect distillation : This method is the simplest, but has a reduced yield. This is used especially by vessels that have a source of energy. As with reverse osmosis, the desalination system must be preceded with a pre-treatment, but not as involved due to a lower risk of clogging. On the other hand, the final treatment of remineralisation is required because of the very low mineralisation of the water treated. 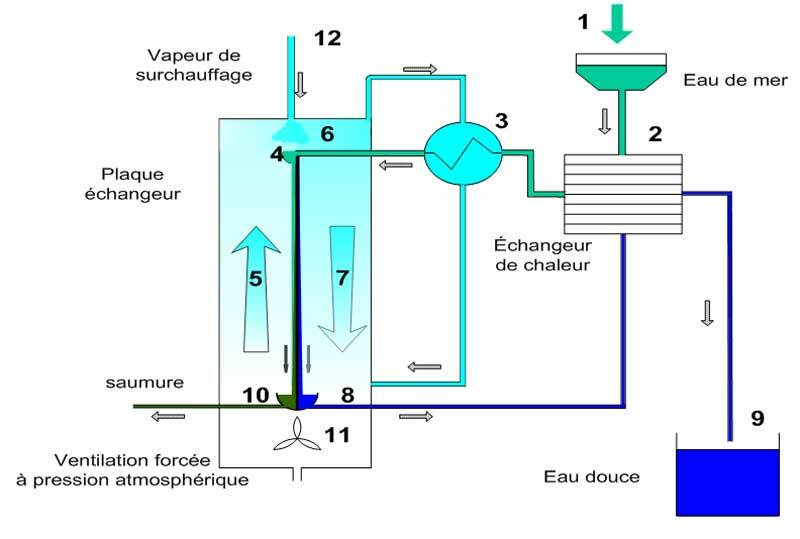 Desalinating seawater can be accomplished using renewable energies (solar or wind). Reverse osmosis will be preferred over the heat methods. The latter can concern only small units. In addition to the high cost, their discontinuity must be taken into account (solar) and climate variations (solar and wind), which is why the energy has to be stored. Intended especially to attempt to solve the problems of sites or regions where it is not possible, or cannot be considered financially, to build large installations, these techniques are currently being developed by small innovating companies and will be further developed and will open interesting perspectives, especially in certain regions in the developing countries. As such, the recent and ingenious company TMW (Water and Heat Technologies, Paris) has just perfected a simpler and cheaper process for desalinating seawater or brackish water, the "Aquastill", a single-piece and all-terrain mobile unit for remote sites for which the principle is based, not on reverse osmosis or on distillation, but on the condensation of water vapour, which requires much less energy than distillation. In sum, the system consists in streaming the salt water via gravity over a simple plastic plate, therefore inexpensive, and in evaporating it (not boiling it) via diffusion in the air flowing at counter-current. 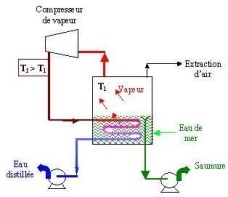 This hot air and engorged with water vapour is then overheated, for example by adding vapour, in order to facilitate its later condensation, which takes place when, hot and wet, it passes to the other colder side of the plate, and is deposited on it due to the difference in temperature (a little like it does for example on a window, cooled on the outside, the hot and moist air in a room or in a bathroom with a hot bath). This process makes it possible to recover half of the seawater as freshwater. It also allows for the treatment of water that are overloaded with certain metals such as fluoride and arsenic. It consume only 0.2 Kwh/m3 of electricity (the power to run an air circulation fan) and 60 Kwh/m3 of heat. It does not require and pre-filtering or chemical pre-treatment. A unit with a capacity of 10 m3/d weighs 90 Kg. This company also has the merit of having offered development NGOs to install a few pilot installations free of charge on sites or in communities with low income. Regardless of the process retained, desalination of water makes use of technologies which are most often relatively complex which require a real degree of technicity in order to operate them in good conditions. Moreover, special precautions must be taken when choosing the material used due to the very high corrosiveness of seawater and of the surrounding air. Materials made of plastic are recommended for the low-pressure circuits and special stainless steel for the high-pressure circuits. The volume and the availability of seawater have no limits. Subject to the solvency of the population served, desalination of seawater is a possible solution for supplying cities and villages located near a coast. Costs have decreased a lot over the last twenty years in such a way that it is becoming an economically viable alternative compared to the construction large infrastructures including dams and distribution ducts over long distances. New types of processes and installations on a smaller scale are furthermore opening new perspectives that are less expensive. Desalination of seawater is still an expensive means among all of the methods for produced drinking water. Due to the high cost for the construction and the operation of the large industrial plants, desalination can especially be considered only when there is no other alternative and when the population has enough revenue or if it is carried out with new processes that are better suited to small units. In addition, it discharges brine into the sea environment which is highly concentrated in salt because of the desalination and which can impact marine ecosystems especially within an area of 300 m if substantial precautions are not taken. The cost of building a desalination unit varies greatly according to the capacity and the local conditions. The total costs is approximately between 1,500 to 3,000 Euros per m3/day of production for average-sized facilities (less than 1,000 m3/ day) and between 1,000 to 2000 Euros per m3/day of production for the large facilities with several thousand m3 per day. The operating cost is highly dependent on the local cost of energy, primarily in the form of heat for the thermal processes and in the form of electricity for reverse osmosis). As the total cost includes the energy, chemicals, replacements and labour, it therefore varies greatly. For industrial facilities, it is approximately between 0.5 and 1.5 Euros per m3 of water treated according to the size, process and local cost of energy.